The TriMet Board of Directors today adopted the agency’s Fiscal Year 2018 budget that continues TriMet’s investment in expanding service and reliability. The $1.2 billion budget includes $534.7 million for day-to-day operations as well as $203.1 million in system investments. For the fifth year, the adopted budget does not include any increase in fares. TriMet’s fiscal year runs from July 1, 2017 through June 30, 2018. 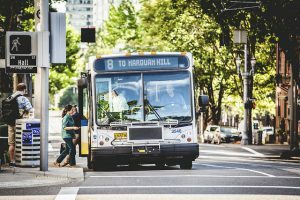 TriMet is in the second year of a 10-year expansion of transit service throughout the region focused on improving reliability, better matching service to demand, connecting people with jobs, expanding service hours and easing crowding. It’s funded in part from the increase in the employer payroll tax approved in 2015 and phased in over a 10-year period. In FY2018 bus service hours will increase 3.42 percent – or 1,360 hours a week, with service improvements set to be implemented in September 2017 and March 2018. Service will be added midday and on weekends on frequent service lines, reducing time between buses, improving schedule reliability and reducing crowding on vehicles. A new line along SW Denney Road and Hall Blvd between Beaverton Transit Center, Washington Square and Tigard Transit Center. Lines 6, 81 and 87 will have route changes for better connections and Line 87 will begin running on weekends. We continue to accelerate our bus purchase program with 57 new buses coming in FY2018. By the end of the fiscal year, TriMet will have a total of 433 buses on the road that have been purchased since 2012, and the average age of the entire fleet will be reduced to about eight years. The budget also includes the launch this summer of the regional electronic fare system, Hop Fastpass™. Hop will make it easier, faster and more convenient for riders to board and pay fares. Riders earn a day pass after purchasing two tickets in a day. The same is true on a monthly basis. Once riders reach the cost of a month pass, rides are free the rest of that month. Hop fare cards will be available at more than 500 area retail locations. Design track, signal and switch improvements on the Steel Bridge and in the Lloyd District, with construction taking place in FY2019. Continue work on the four-year replacement of overhead power contact wire on the original MAX Blue Line between Cleveland Ave in Gresham to Lloyd Center. Construction of three Bike & Rides at Goose Hollow, Beaverton Creek and at Gateway Transit Center that includes secure parking and security cameras. Investments in safety include a new police precinct facility, rail crossing improvements and enhanced training for rail operators. Approximately $9 million will go to building a new Transit Police facility in the new Convention Center Hotel parking structure. The current leased facility is already too small for Transit Police and TriMet security operations and in need of repairs. TriMet is in the third of a five-year program to replace analog closed-circuit television (CCTV) equipment on older buses and MAX trains. Newer vehicles are already equipped with digital technology. Positive Train Control (PTC) upgrades will be completed on WES Commuter Rail. The federal PTC mandate prevents collisions caused by human error. Pedestrian crossings will be improved at 5 locations along the MAX Blue Line to help riders be more aware of an approaching train. For the fifth time in nearly eight years, non-union employees will see up to a 3 percent wage increase based on performance and overall compensation. Since the union contract expired on Nov. 30, 2016, no union wage increases are included in the budget, as union wage increases are negotiated. Those negotiations are underway.